Bay Lake Tower at Disney's Contemporary Resort a new Disney Deluxe Villa Resort has been designed to complement the fabled styling of the classic Disney's Contemporary Resort building and promises to deliver some of the most dramatic views available anywhere at Walt Disney World Resort. 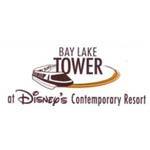 Bay Lake Tower balances a modern and luxurious experience with warm and innovative features. This description extends to its exclusive and impressive pool complete with a unique water slide wrapped in an intriguing glass block.